Okay, after my saga with photobucket (!! ), here at last is my report on my recent tour of Wilmot-related places plus a couple of Libertine locations. Before I go on, I must first give a huge thank you to suec, who has given me a tremendous amount of help. As many will remember, she did a wonderful Libertine tour for us a while back on ONBC. She e-mailed me several times with maps, directions and tips – she even gave me the e-mail address of the vicar of Spelsbury Church! Since I don’t drive this trip required a lot of planning, and it would have been very difficult for me without suec’s help – so thank you sue, I could not have done this without you!! I would also like to thank theresa, Itd, Trinni and everyone else here who has so patiently and kindly directed me through the wonders of photobucket - this is the first time I've ever attempted to write a report for the zone let alone post pics so please bear with me if there are any glaring errors! This shows the Clock Court where they did some filming for The Libertine. The pillars are used in the film to represent the entrance to The Duke’s Theatre. Johnny, Tom and Johnny V. are clearly shown walking towards the pillars in the scene just before Alcock returns in his livery. This forms the background for the scene where Wilmot says to him “you came back, etc”. 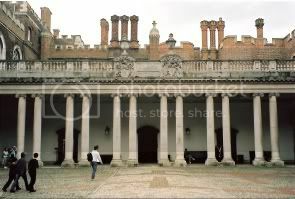 It is somewhat appropriate because parts of Hampton Court were designed by Sir Christopher Wren and he also designed the long-gone Duke’s Theatre. The court is, I’m pretty sure, also used in the scene where John and Lizzie B. are walking in the street together and he asks her to close her eyes. In reality this is no street, but a courtyard enclosed on all sides by the building…it’s big but not that big, the filming must have been somewhat chaotic, with all the people, carts and dogs, etc! It’s very interesting to see how they turned it into what looks like a street! 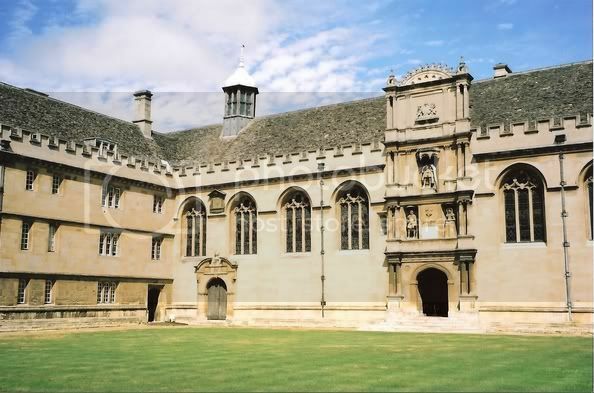 For my Oxfordshire tour, I began in Oxford itself, with Wadham College, which Rochester attended for some two years from 1660. I know little about the educational system in those days, but would imagine a man would be admitted to university at this tender age due to the shorter life expectancy. 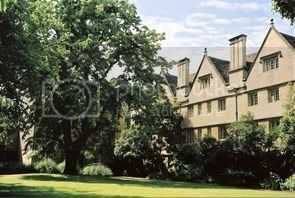 Wadham was then a relatively young college, founded in 1613. Here, the initially quiet and studious Wilmot studied Latin and Greek, science and probably astronomy. Here also, he fell under the tutelage of Robert Whitehall, a man of questionable reputation. There is a school of thought that he was responsible for Wilmot’s becoming debauched. He would lend John his academic gown and Wilmot would explore the inns, taverns and brothels nearby. However it was at the college that he wrote his first poems and he graduated with an honorary Master’s degree at the age of 14. The college is in the centre of Oxford and easy to find. It is not far from the Radcliffe Camera and the lovely Bridge of Sighs. Looking at the picture in Graham Greene’s “Lord Rochester’s Monkey” it appears to have changed very little from its early days, apart from some alterations to the garden and the quadrangle, which is now lawn and in Wilmot’s day would have been gravelled. It is a elegant, gentle building in the gothic style and larger than I was expecting. Most of the colleges are open to visitors and I was able to walk into the quadrangle and explore a little. Unfortunately the hall was closed on the day I was there, but the chapel was open. It houses a fine Victorian organ, but otherwise is probably largely unchanged since Wilmot’s day. The tutorial rooms are not open to the public, but walking round I was able to take a glimpse through some of the windows. The ceilings are low and some rooms have beams and small fireplaces. It was not difficult to imagine life there hundreds of years ago. The gardens are beautiful, with huge trees and well kept borders. The college is quite close to a main road, now thronged with buses and cars, etc., whereas in Wilmot’s time it would have been at best, a narrow cobbled street. It is pleasing to think however, that JW would probably easily recognise his old college were he able to return to it. My next stop was the village of Adderbury. This was quite a treck out of Oxford, a good hour’s ride on a local bus. A lovely journey through one of the most beautiful areas of England. The countryside is gently undulating, all hedges, fields and thatched cottages, many of the latter being beautifully kept, with flower baskets and colourful gardens. The bus dropped me on the edge of Adderbury Village and for a while I was quite lost! I really was out in the country here, only the birds broke the silence for there wasn’t a soul to be seen! Eventually I began to understand the map.. Adderbury is larger than I was expecting, again, lots of thatched cottages and very pretty lanes, and just one or two small shops. Eventually I reached the village green and from here (thanks to suec’s directions) I realised where to go. 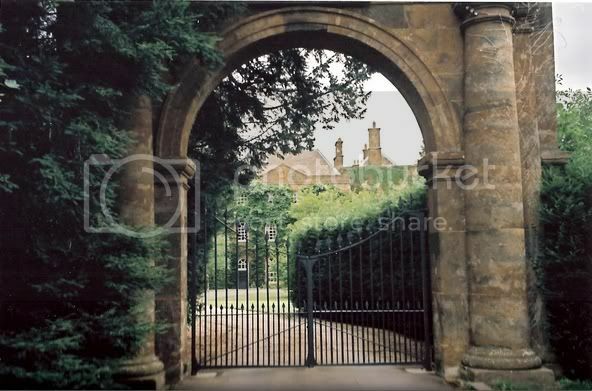 Just ahead of me lay the gates to Adderbury House The main Oxford-Banbury road now runs through the village, and AH is just off there…I crossed the road and there I was! There are two gateposts which probably formed the entrance to the estate during Wilmot’s time. 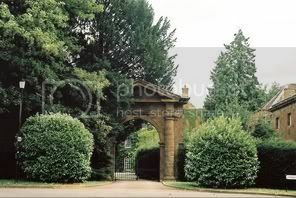 A short road leads up to the house, which stands beyond an imposing gated entrance and is enclosed by high hedges. The house was until recently a home for elderly people, but is now privately owned and is beautifully maintained. Part of the former coach house is currently for sale. I would imagine the new owners have had it divided into apartments (perhaps AH itself is now apartments, difficult to tell). A small housing estate has now been built around it. I have to say, although I took photographs, I was very careful about doing so. As the house is now overlooked by other properties and there were people gardening, walking dogs, coming out of driveways etc., I didn’t like to linger. I took a couple of pictures and left it at that, being conscious that the house is obviously now private property, and not wanting to intrude. 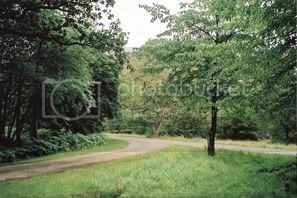 I followed the road around to the left of the house as there is now a nature reserve on the land behind it , and this is open to the public. Adderbury Lakes is a very pretty reserve, quite thickly wooded. I walked down the little winding pathways, and soon came to the “lakes”, which are actually more like ponds. Lots of birds and wildlife…I peered through the hedges (!) and could see glimpses of the back of the house. 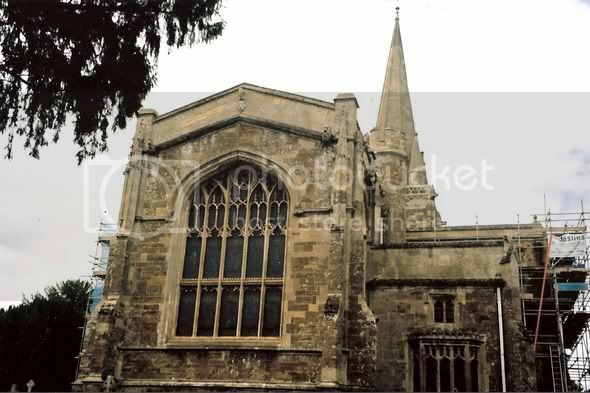 Walking back via the village green, I visited Adderbury Church. This dates back to about 1250. Unfortunately I was unlucky because there were builders working on the church roof and I couldn’t go inside for health and safety reasons! 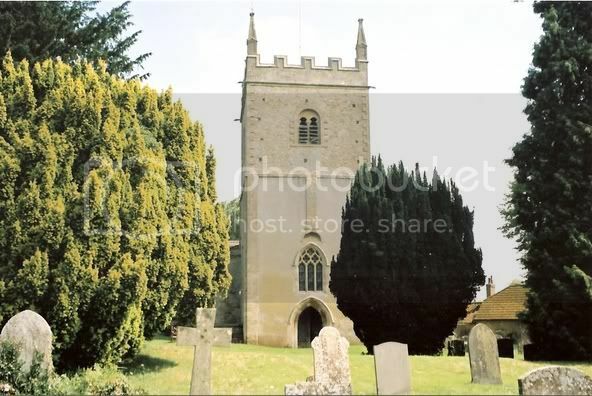 The church is of interest re Wilmot because his children were christened here (events he attended) and it is known his family attended services here (the Wilmots had their own pew, as did the Cobbs, another prominent Adderbury family in those days). These pews were eventually removed in late Victorian times and used as panelling within the church. I did however walk round the churchyard. According to Graham Greene’s book, the Wilmot daughters’ nurse is buried here, but I was unable to find the gravestone. Some of these graves are very ancient and the writing has been completely obliterated by weather and time. The church is beautiful and sits on a small hill . It is surrounded by cottages and small village buildings, including a tithe barn which Wilmot would have seen. Adderbury House would have been close to the centre of village life in those days, and from the top rooms there would be a view of the village green. Here it is said were kept the stocks and other forms of punishment meted out to miscreants. Surely here would have been also pleasant events such as village fairs and maypole dancing etc. Ann Wilmot, John’s mother, seems to have taken an interest in the lives of her servants and perhaps both she and Elizabeth Wilmot would have been involved in village life, as much as noblewomen would have been in those days. Here John’s little son lived his short life and his three beautiful daughters grew up. I could imagine him thundering through the gates back to London in his carriage, desperate to escape family life, yet plagued by guilt because of it. Modern Adderbury is of course not far from the bustle of traffic and city life, but parts of it seem very undisturbed and peaceful, and it’s not hard to imagine how it must have been all those years ago. 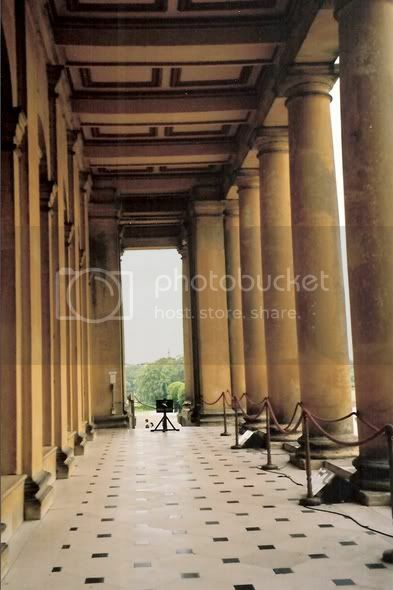 This column of pillars can be seen in the film, where John and his wife are talking about the game of pall mall , “you must always be ace, King and jack my dear…” etc. 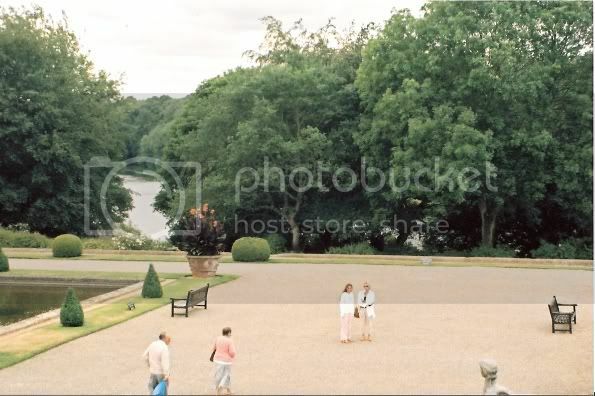 Johnny and Rosamund would have walked through the famous Long Library to reach this covered walkway, and as they walked towards the camera they would see the most beautiful view of the forecourt and grounds stretching before them. In the film, when they look down towards the game, I don’t think this was a split shot, as that is the exact viewpoint from the gallery. During the Blenheim tour, the public are given access this way to reach the Palace chapel. The Palace has an identical walkway on its opposite side, but that is not open to the public…I was keeping my fingers crossed that the “Libertine side” would be open, and it was!! I confess it was thrilling to stand on the exact same spot as Johnny, lol! The walk to High Lodge is a long one. Suec had warned me about this, but I decided to allow myself some extra time and was glad I did. The park surrounding Blenheim Palace is enormous and maps can be deceptive. 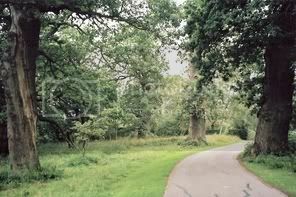 The grounds were laid out in the eighteenth century by the landscape architect Capability Brown. High Lodge lies in the most remote and untouched part of the estate. The walk begins by crossing some of the most beautiful parkland I have ever seen…great acres of fields with huge trees and every way you turn there is a breathtaking view. The Palace in the distance was my marker. About halfway through the walk I reached a bridge which crosses the river, the views from this point are just beyond words. A lovely lake stretched to my left with velvet-like lawns sweeping down to it. In the distance you can see the little church where Winston Churchill is buried, in the village of Bladon. To my right was part of the river which channels the water from one lake to another. Crossing the bridge, the walk begins to climb…the road is paved and the public are allowed to walk upon it, but not to drive vehicles or leave the verges. I had passed a couple of other walkers so far, but now I was alone. I didn’t mind, it helped me to focus and to concentrate on what I was seeing. I had a surprise, because up ahead was an old stone wall, and a gateway. To the right of it was a tiny cottage, like something out of a fairy story, for now quite suddenly the path enters the woods. These woods are a surviving part of the ancient Woodstock forest and some of the trees are over 900 years old. Into the woods I walked, the trees and the silence closing around me. Here are some of biggest oak trees I have ever seen, amongst silver birches and firs. The only sounds came from the birds, the animals in the distant fields, my footsteps and the whispers of the leaves. I was scared, but entranced. How many places are left where you can experience something as provocative as this? On and on the path climbed…now and again I would reach a corner and think, this will be it, but no, the walk went on. It was a hot summer’s day but so dense were the trees, here there was only the cool and the dark and the delicious scent of leaves and ancient earth. Now and again a dead oak made a stark picture – the trees are left like this when they die because the insects that feed from them continue the life cycle of the wood. Apart from maintenance, these woods have been left untouched for hundreds of years. The atmosphere is both sinister and mysterious. And just when I thought I would never get there, I suddenly saw the battlements of the Lodge high above the trees! At first I was concerned I wouldn’t be able to see much of it – I had not accounted for it being summer and everything being in leaf and bloom…a high, dense hedge surrounds the house on one side. A little pond skirts the front of it..I walked to the crest of the path and tried to get my bearings. Tantalising glimpses of gothic windows glinted in the sunlight, and through the hedge I could just make out the basic shape of the building. There is a farm gate leading on to the property, but no sign announces it. A few cars were parked on the driveway. I would imagine the Lodge is used as accommodation for estate workers. It is too buried and happily undeveloped to serve as a venue for corporate entertaining and although visitors are allowed to walk past it, I would not say they are encouraged. No sign points to it, nothing indicates it is there. I tried to take some photos but knew they would be more hedges and trees than Lodge. I decided to see if there was any access round the other side. There was no-one around so I left the path and began to climb through the densely wooded undergrowth! This actually led me to the front of High Lodge. There, covered in ivy and brambles, are two old gateposts, and a set of iron gates. I tip-toed up and peered through – and there was a wonderful view of the Lodge! Comparing it with the old engraving shown in many of the books on Rochester, it can be seen that in his day it was a simple farmhouse with a hipped roof. If you look at the photo, you can just see the old roof behind the battlements. The tower and battlements were not added until much later. When the architect Vanbrugh was building the Palace, he altered High Lodge to make it more comfortable for the Duke and Duches of Marlborough, the new owners, who stayed there whilst their palace was being built. The Lodge was altered again in the late 17th century, and this is when the battlements were added. In the engraving the lodge is surrounded by a high wall..the original gated entrance where I stood can clearly be seen. The wall is long gone, but the hedge and current fencing follow the original layout as far as I can tell. In Rochester’s time the aspect was more open. Perhaps the tower was added so its later inhabitants could enjoy the view once the woods grew more dense. This was a hunting lodge when Rochester owned it and it continued to be used for this function. In the guidebook there is a photograph of an Edwardian shooting party sitting infront of it, with King Edward VIII in the centre. A pretty garden has now been laid out and deck chairs and umbrellas indicated current residents, so I knew I must not linger! ! This was someone else’s home long ago - Rochester’s escape from London and from family life. Here it is said he had lascivious pictures painted on the walls, here he brought various “ladies” from Woodstock village, including one Nell Brown “a very nasty, silly creature”, here he entertained his friends and neaby in in one of the rivers rivers they took a swim and then ran naked for “a dash of 40 yards”. It is not hard to imagine how remote this place would have been when Rochester knew it. Perhaps the woods were sparser but he would still have been enclosed by Woodstock forest and the roads would have been no more than dirt tracks, barely passable - Imagine this lonely house lit only by candles! Rochester would write and study here, alongside his other activities and here of course he died, following much torment both physical and mental. Time stood still. I didn’t want to leave..High Lodge has a mystery and a magic about it that is hard to put into words. These days there are very few places that are far from somewhere, but even in 2006, this feels like a remote, forgotten place. It is hard to imagine that many people visit here, or even walk this far to discover it and even if they do it is doubtful they know its history though they may sense its air of reticence. Silent and secretive, the house still guards the privacy of its notorious former occupant. Sometimes I think it’s a pity there is no real memorial, no museum commemorating Rochester, but if there ever is, it shouldn’t be at High Lodge. There are secrets here and and secrets should be kept. I began the long walk back and suddenly there were one or two people on the path, a car went by and it was as though the 21st century had suddenly come alive once more. My final Rochester visit was to Spelsbury. This was the hardest place for me to reach, as it is a very tiny village indeed and has little or nothing in the way of public transport. I took a bus to Charlbury, the nearest village. Charlbury is if anything, even prettier than Adderbury. There are Rochester connections here…he was born very close by at Ditchley and Cornbury House is adjacent to the village. 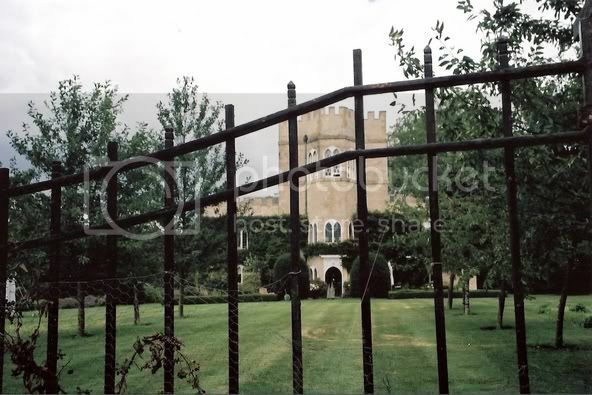 Rochester and his wife both visited Cornbury, which in their time was owned by the Clarendon family and it is mentioned frequently in Rochester’s letters. Arriving at Charlbury I was unable to work out if a bus went to Spelsbury or not, so, armed with my map, I began walking. This was quite a dangerous walk – 2 miles uphill along a somewhat busy country road, with no pavement (sidewalk)! I had to be very careful when coming to blind corners and began to question what I was doing. It was even hotter than the day before and I began to ask myself if it was worth it, but I had come this far and wasn’t about to give up now. This is rich farm country – gentle hills, corn in the fields, pretty farms. After an hour I reached Spelsbury village and it is very small indeed – just a few cottages, the almshouses built by Rochester’s mother following his death, and, easy to find, the church. Spelsbury Church is at the end of a cul de sac and I pushed open the gate into the churchyard. The silence enfolded me after the hot, anxious walk. I put down my bag and let the peace of the place seep into my soul. Here is an ancient church (over 900 years old) in a tiny English village on a perfect, hot summer’s day. Insects hummed around the flowers as I walked. And the view! The church faces rolling hills and fields. Somewhere far away I could hear a tractor, the distant hum of traffic, but nothing could interrupt me here. I went up to the church door, silently praying it would be open, and it was! I was still alone and took a few moments to take it in. The church is very lovely, simple wooden pews, some beautiful stained glass. 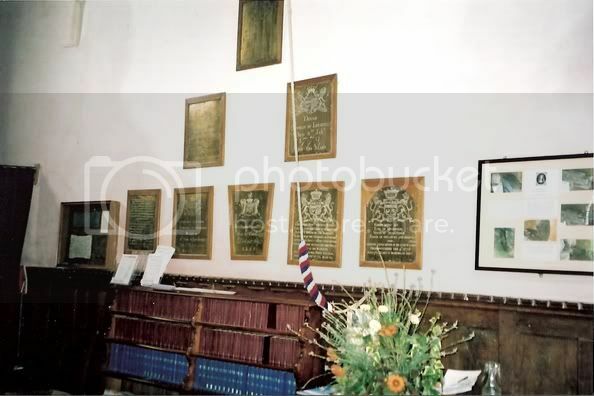 I had problems finding Rochester’s memorial – I had expected something bigger, but then I spotted it, a glass case on the north wall, containing his coffin plate, Elizabeth Malet’s and that of their young son, Charles. Further along the wall is another case containing photographs of Rochester’s coffin being opened. This was done by the vicar some years ago in response to rumour that the coffin contained valuables. Between the two cases other coffin plates are displayed, belonging to various of Rochester’s relatives. I stood there for a good while, reading everything, taking photographs, studying the plates. On a table I found an interesting leaflet about Rochester (will add it here presently), probably written by the vicar of the church. It mentions that there is renewed interest in Wilmot’s life. The leaflet was printed in 2005, so this could be in reference to the film. I then spent some time in the churchyard, photographing the church. I had e-mailed the vicar for information about opening times and in his helpful reply he volunteered the information that Rochester and his family are interred in the church vault, which lies beneath the north transept and was accessed from outside. Walking around, I came to a large stone structure on the outside of one corner of the church. This looked as though it could allow access underground. It is photographed in Graham Greene’s book, so I would draw the conclusion that this is indeed the entrance to the vault. The ancient stones are covered with wild flowers and ivy, so nature has provided this half-forgotten family with its own memorial. I picked an ivy leaf to keep and then sat for a while on a seat overlooking the countryside, and confess to feeling emotional. Sometimes I have to remind myself that Rochester was not the nicest person in the world, but that doesn’t seem to deter my fascination for him. I had felt close to him all week, but particularly so at High Lodge and now here, at his final resting place, Spelsbury. The spectacular view over the gentle, rolling farmland was timeless. I doubt much of this has changed since Wilmot was buried here. *my apologies, for some reason the links are still showing in the final post..am afraid to delete them incase it deletes the pics though I have another pic. of Adderbury house which hasn't come up on the post, but I'll try and sort this out tomorrow, exhausted now, lol. Hope everyone finds this of interest. Last edited by Jackslady on Mon Aug 14, 2006 3:15 pm, edited 2 times in total. Jackslady, I was brought up in Chipping Norton, just down the road from Spelsbury and Charlbury. Of course then I knew nothing about Rochester. I used to go to those villages very often.I love your notes about the church at Spelsbury, they catch the mood of the village so well. How I would love to go therer again and see these things. Thanks so much for bringing these places back to my mind! How very beautiful, dear jackslady! Thank you so much, first, for making the journey and second, for sharing it with us. It was a lovely break on a hectic afternoon and I really appreciate the effort you put into it. Very nicely done. Thank you my friend for taking so much time and trouble to put into words your journey and how you felt whilst taking it. Just reading your descriptions of the places and atmosphere makes me feel as if I was there with you. I also admit to becoming very emotional when reading about High Lodge and especially Spelsbury. If I feel like this at home I can only imagine how you must have felt actually being there so close to Wilmot's final resting place. Thank you again, I've really enjoyed reading this. Last edited by In-too-Depp on Mon Aug 14, 2006 6:02 pm, edited 1 time in total. Thanks Jackslady for the great tour of your trip and I love your pictures. Jackslady, what a wonderful piece you have written for us! I too have a fascination with Rochester and how I would love to visit these places in person one day! Until then, we have suec's and now your beautiful tour to make us feel like we are there. Thank you so much! You brought tears to my eyes with your beautiful tour. I'd love to do it. I to, am fascinated with Rochester and it's all thanks to Johnny. A lovely account, Jackslady, which I thoroughly enjoyed reading. It has evoked some special memories for me. I see that Spelsbury has upgraded its display. Adderbury House is a bit of a puzzle. I hadn't realised that part of it had been pulled down. I have just finished reading 'A Profane Wit'. In it, the author states that the house John Wilmot lived in was pulled down after his death and rebuilt on the same site - by his half-nephew, I think. I didn't know that when I saw the house. I must admit to feeling a vague sense of unease at the time, because it looked like a contemporary of Blenheim with its Palladian style. I thought it must have been modernised at that time. After all, plenty of old houses have had new frontages put on them. But it seems that the family did to Adderbury what they did to Ditchley. Nevetheless, it is interesting that it still has a date of 1625. High Lodge at least, is still there. You create the feel of it so well. I watched a programme recently about Capability Brown. According to the programme, it was Brown himself who designed the gothic appearance of it. They showed a house as it must have looked before it was given the makeover and a shot of it as it is today. I taped the programme but unfortunately, I only have a video recorder, not a DVD, so I can't take screen caps. Thanks again for your account. Lovely to read. Jackslady, thank you for this excellent account that allows those of us who can't get "across the water" to almost be there anyway! You are a wonderful writer...do you have any fanfics posted, by chance? So glad you took the time to share this! Jackslady, thank you so much for your incredible essay and pictures. I am constantly amazed at the talent, and compassion of fellow Zoners. Your dedication is admirable. It is a grace to be remembered after our deaths. It is lovely that Johnny's art has brought that grace to Wilmot, to Barrie, and even to Ed Wood. I'm glad you could make the journey, and share it with us. What can I say that has not been said already!!!!!! The essay is beautifully written and it had just the right tone and detail to make me feel as if I was with you on this journey. Thank you for letting me share this!!! Fabulous writing, beautiful photos! It is amazing to me to think that all of these places existed before the United States even started! It is easy to understand Johnny's comments about the USA's youth in the scheme of history. I agree, ONBC has some of the most talented and insightful and intelligent members anywhere! Jackslady, you rock! Wow Jackslady..I'm just stunned at how well written this is. Thank you so very much for sharing your adventure with us. I feel so blessed to be able to hear all about it! Love the details you put into it. I have always wanted to go to Britian and explore the countryside...not to mention follow in the footsteps of such history...who knows when it will be possible for me to do that in person....thank you so much for taking the time to do this!